As a parent, I always worry about my children getting enough fruits and vegetables in their diets. My husband and I have gone out of our way with different cook books to try to sneak them into our meals at times. Unfortunately, doing that is not always practical. This worry was amplified a few months back when I took my youngest for his 18 month well check up. JSL is a picky eater to say the least. There are days that he will barely eat anything. The exception to the rule would be cheese. Most days I can get him to eat at least that once during the day. Of course, a diet of only cheese does not fulfill the daily recommended amounts of vitamins and other important nutrients in his diet. Our doctor expressed her concern that day. Her main point was the lack of steady protein in his diet. Since JSL did not drink a set amount of cows milk (he is still nursing) we were not sure what his daily intake is. We eat a lot of soy products, but she wanted to make sure additional protein was added to his diet. We were worried about starting milk and or peanut butter too early. 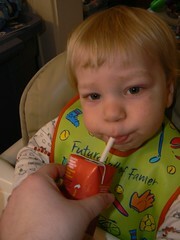 Our oldest son had a milk allergy (only to plain cows milk), so waiting as long as possible to introduce that was key. When we went shopping we kept eyeballing the different nutritional drink supplements for children and wondered about them. At about the same time, I was given the opportunity from the Family Review Network and Nestle Nutrition to try Boost Kid Essentials Nutritionally Complete Drink. BOOST Kid Essentials Drink is the only nutritionally complete drink that provides kids ages 1 through 13 with immune-strengthening probiotics plus complete, balanced nutrition. A daily serving of the probiotic found in the BOOST Kid Essentials Drink straw has been clinically shown to help strengthen the immune system. Whether a child is having trouble gaining weight, is below growth percentiles, resists eating enough nutritious foods, or needs extra nutrition to maintain an active lifestyle, BOOST Kid Essentials Drink can fill in nutritional gaps. 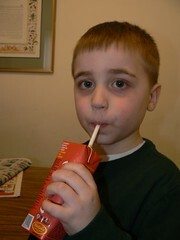 More information about the benefits of the probiotic straw can be found on the parent page on the Boost website. 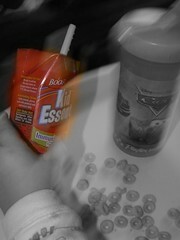 Both of my boys were very intrigued with the Boost Kid Essentials package when it arrived at our house. I placed the boxes into the refrigerator so they would be chilled for the boys. The other morning, the little guy refused to eat breakfast. We were heading out for a lot of errands and I did not want him to be hungry. 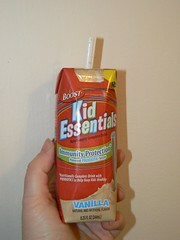 This was the perfect opportunity to try the new Boost Kid Essentials product. As soon as I put the box onto his tray, he grabbed it. His little hands had a hard time holding it, so I assisted him. JSL really seemed to like it. He kept asking for more and finished most of the 8.25 ounce drink. My five year old son also wanted to try. He was immediately in awe of the larger extended straw that is on the box. Little did he know that it contained live active cultures to help boost his immune system. This thrilled me since kindergarten, and all classrooms in general, tend to breed a lot of germs. NHL immediately told me that it tasted like a milk shake to him. He liked the flavor and asked what other kinds they had. When I told him chocolate, he asked if we could get some of that to try one day. I told him sure since both of the boys really enjoyed it. Of course, I had to take a taste. It had a very nice vanilla flavor and was smooth. I know a lot of the other nutritional drinks can be gritty, but this was not. We will definitely be purchasing more Boost Kid Essentials for our boys. It is a good thing for us to have on hand for those days when the kids need a little something extra. At least I know my little guy will drink this and not toss it on the ground like most of the foods that we try during these tough toddler days. If you are interested in trying Boost Kid Essentials for your child, head over to their website for a $5.00 off coupon if you register your e-mail address. Then head to a retailer near you to find it nationwide. Glad to see you found something to give your kids nutrients. I am not having this problem yet, my son eats anything we give him! John’s last blog post..Should We Have Another Baby? Interesting! I haven’t seen that around and will have to look for it. I give my son Pediasure because he’s not a great eater, either. OMG! I love you for this! I have been searching for something for my daughter. She is such a picky eater and so far I’ve had no luck with Ensure or Carnation Instant Breakfast. I am so heading right over and grab that coupon and find a retailer here…I hope. Melanie aka lilknitter’s last blog post..This Is What I’ve Been Up To….